Just home from spending the night in hospital with Mandrake Jr. after an asthma attack. We spent over 4 hours sitting in a room in A&E and finally got a bed for the night in the Children's Ward after 1am this morning. Boy it's hard to help the time go by with all those white walls. I wasn't prepared to stay the night so next time I will remember to go prepared for the worst. The staff were great though - and Mandrake Jr. is doing fine. I must also say that Mandrake coped really well at home with the other 3 kids - thanks honey! 8. Talk about the neck braces stacked on the shelf in the room and why people need them, how they are worn, who wears them... and every other question you can imagine would come regarding neck braces! 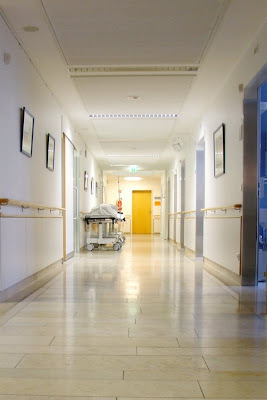 Take a bag of marbles to roll along that lovely long hospital corridor and then count how many visitors trip over them.